Meng Ji, Wei Wang, Wen-li Hu M.D. Background: The Enterprise stent system (Johnson & Johnson (Shanghai) Medical Equipment Co., Ltd., China) is a closed-loop, recoverable self-expanding stent that is effective in the treatment of intracranial aneurysm. However, most studies on the treatment of intracranial aneurysm after ischemic stroke are case series or case reports. Methods/Design: We will perform a single-center, double-blind, randomized parallel-controlled trial at the Department of Neurology, Beijing Chao-yang Hospital, Capital Medical University, China. A cohort of 100 patients with atherosclerotic ischemic stroke will be randomly allocated to undergo either Enterprise self-expanding intracranial stent implantation in combination with antiplatelet medication (stent implantation group, n = 50) or only antiplatelet medication (drug group, n = 50) for treatment of carotid artery stenosis. Four time points (0.5, 1, 2, and 3 years after stent implantation or antiplatelet medication) will be selected for outcome observation and evaluation. The primary outcome will be the National Institutes of Health Stroke Scale score, which is used to evaluate neurologic deficits. The secondary outcomes will be the Barthel index and carotid stenosis rate. Discussion: There is a lack of randomized controlled studies addressing the long-term effects of the Enterprise self-expanding intracranial stent system for carotid artery stenosis in patients with ischemic stroke. This study will investigate and further confirm the clinical significance of the Enterprise stent system in the treatment of carotid artery stenosis in patients with ischemic stroke. Trial registration: This trial was registered at ClinicalTrial.gov (NCT02802072). Ethics: The study protocol has been approved by the Ethics Committee of Beijing Chao-yang Hospital, Captical Medical University, China (approval number: GJCY16012) and will be performed in accordance with the guidelines of the Declaration of Helsinki, formulated by the World Medical Association. Informed consent: Written informed consent will be obtained from participants or their guardians prior to inclusion in this study. MJ and WLH conceived and designed this study protocol. WW recruited the participants. MJ collected and analyzed the data. All authors approved the final version of this paper for publication. Atherosclerosis is a chronic degenerative disease that can cause intracranial carotid artery stenosis, which is a leading cause of ischemic stroke. The currently used interventions for carotid artery stenosis in patients with ischemic stroke include systemic medication, carotid endarterectomy, and carotid angioplasty and stenting. Systemic medication for carotid artery stenosis is mainly administered to reduce risk factors for cerebrovascular disease and includes anti-platelet aggregation agents, anticoagulation agents, blood lipid- and pressure-lowering agents, and drugs that control the blood glucose concentration; improvements in patients' living habits can also reduce risk factors for cerebrovascular disease. Systemic medication is generally recommended for patients with mild carotid artery stenosis. Carotid endarterectomy has been confirmed as the gold standard treatment method for carotid artery stenosis (Hobson et al., 1993; Halliday et al., 2004). However, it is also limited by its sophisticated technique, high degree of tissue trauma, requirement for general anesthesia, risk of severe stroke, 9.0% fatality rate, and 7.6% cranial nerve injury rate (Zarins, 1996). Moreover, carotid endarterectomy is not suitable for patients with high-position or tandem carotid artery stenosis or carotid artery stenosis complicated by contralateral carotid artery occlusion. In recent years, carotid angioplasty and stenting has been increasingly used for the treatment of carotid artery stenosis in patients with ischemic stroke because of its minimally invasive procedure, rapid recovery process, and wide range of indications (Chimowitz et al., 2011). The Enterprise stent system (Johnson & Johnson (Shanghai) Medical Equipment Co., Ltd., China) is a US Food and Drug Administration-approved closed-loop recoverable self-expanding stent that has been confirmed to be highly effective in the treatment of intracranial aneurysm (Huang et al., 2010; Vajda et al., 2012b; Li et al., 2013). Existing evidence on use of the Enterprise stent system for treatment of intracranial artery stenosis in patients with ischemic stroke has mainly been derived from case series and case reports ([Table 1]). To the best of our knowledge, few randomized controlled trials are reported on use of the Enterprise stent system for the treatment of carotid artery stenosis in patients with atherosclerotic ischemic stroke. In the present study, we will investigate the long-term effects of intracranial implantation of the Enterprise stent system versus treatment with antiplatelet medication on the neurologic deficits, daily living abilities, and carotid artery stenosis in patients with atherosclerotic ischemic stroke through a randomized controlled trial. Single-center, double-blind, randomized parallel-controlled trial. Department of Neurology, Beijing Chao-yang Hospital, Capital Medical University, China. Patients with atherosclerotic ischemic stroke presenting with carotid artery stenosis will be screened against our inclusion and exclusion criteria (see below). 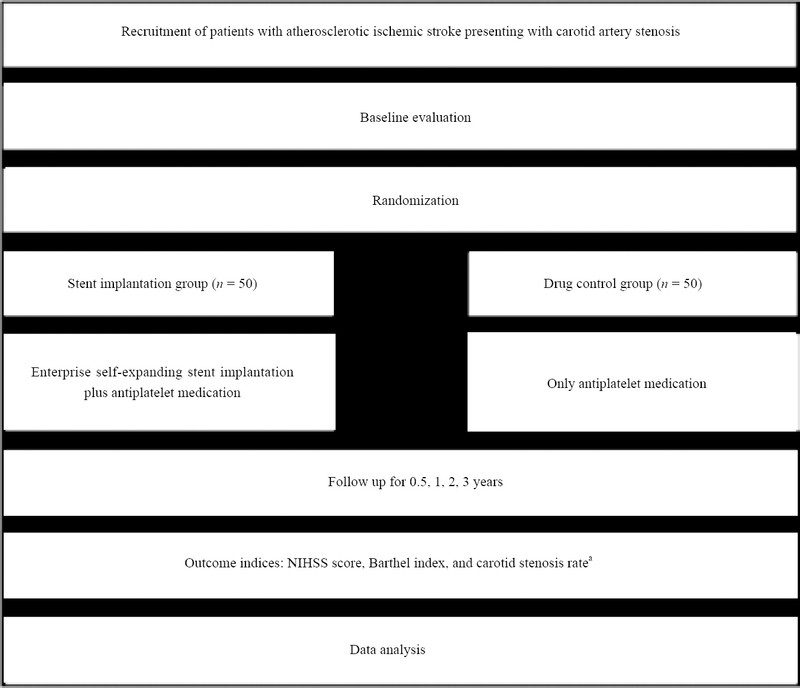 After providing informed consent and completing a baseline evaluation, 100 eligible patients will be randomly allocated to undergo either Enterprise self-expanding stent system implantation in combination with antiplatelet medication (stent implantation group, n = 50) or antiplatelet medication only (drug group, n = 50) ([Figure 1]). The primary outcome will be the National Institutes of Health Stroke Scale (NIHSS) score, which is used to evaluate neurologic deficits, 1 year after stent implantation or antiplatelet therapy. The secondary outcomes will be the NIHSS score, Barthel index (used to evaluate patient's activities of daily living), and carotid stenosis rate 0.5, 2, and 3 years after each treatment. Note: aEvaluation of the carotid stenosis rate at 1 year of follow-up. The cohort will comprise 100 patients with atherosclerotic ischemic stroke presenting with carotid artery stenosis who are scheduled to receive treatment in the Department of Neurology, Beijing Chao-yang Hospital, Capital Medical University, China. Before treatment, a researcher who will not participate in the trial will assign each patient a random-sequence number using SPSS 17.0 software (SPSS, Chicago, IL, USA). After providing informed consent, the patients will be allocated to undergo either Enterprise stent implantation or treatment with antiplatelet medication. The random-sequence numbers will be preserved in an opaque, sealed envelope and opened only after eligible participants agree to participate in the trial. Additionally, the interventions will only be performed in those who agree to participate in the trial. Treatment allocations will not be disclosed to patients or outcome assessors, but will be disclosed to the researchers responsible for stent implantation. The primary endpoint of this study will be neurologic deficits 1 year after treatment as evaluated by the NIHSS score. In previous reports (Ai et al., 2009; Wei et al., 2011), the mean NIHSS score in the stent implantation and drug groups was 2.3 and 1.4 points, respectively (P = 0.022). A two-sample t-test [differences] equipped by Power Analysis and Sample Size 11.0 software (PASS 11.0; NCSS, Kaysville, UT, USA) was used to calculate the sample size. The level of significance was α = 0.05, and the power was 1 − β = 0.80. The effective sample size was found to be n = 24 per group. Taking a 20% rate of lost patients into consideration, a total of 58 patients will be needed. We will recruit 100 patients with carotid artery stenosis. The sample size calculation was performed according to the intention-to-treat principle. Patients with ischemic stroke presenting with severe carotid artery stenosis from the wards and clinics will be informed of this trial by their attending physicians. Patients who are interested in participation in the trial can contact the responsible researchers via telephone, E-mail or WeChat. Preoperative preparation: Three to 5 days prior to surgery, the patients will begin taking aspirin at 300 mg/d and clopidogrel at 75 mg/d. Operative technique: The right femoral artery will be punctured using the Seldinger technique to introduce a vascular sheath. Heparin will be administered. With the assistance of a super smooth guide wire, a 5F-V ER catheter will be placed in the carotid artery on the affected side for selective angiography. After measurement of the affected vessels, stents with the proper diameter and specifications (generally, stents 2 cm longer than the stenotic lesions and 1-2 mm greater than the vessels) will be selected. An 8F guide catheter will be inserted into the common carotid artery on the affected side. An umbrella-shaped filter will be positioned in the distal end of the internal carotid artery on the same side and then delivered. The Enterprise stent will be inserted along the guide wire of the filter, crossed over the stenotic segment, positioned according to the predesignated route, and slowly delivered under the guidance of bony landmarks. If the stent is estimated to be difficult to cross through the stenotic segment or be fully delivered in patients with severe carotid artery stenosis, a small-diameter artery balloon (3-4 mm in diameter, 15-20 mm in length) will be selected to pre-expand the stenotic parts and thus facilitate introduction of the stent delivery system. If the residual stenotic part is > 30% of the original stenotic segment, then sufficiently larger-diameter balloons will be used for post-expansion. After a recheck by routine brain angiography, the umbrella-shaped filter will be recovered and taken out. Angiography of the carotid arteries in the neck and brain on the ipsilateral side will be performed to examine the stent position and antegrade flow. Postoperative management: Eight hours after surgery, 4100 U of low-molecular-weight heparin calcium injection will be subcutaneously administered once every 12 hours for 3 successive days. Aspirin at 300 mg/d and clopidogrel at 75 mg/d will be simultaneously administered. The aspirin will be continued at 300 mg/d 3 months later, decreased to 200 mg/d 6 months later, and further decreased to 100 mg/d 1 year later. Enterprise stent system: The Enterprise stent system is a closed-loop, self-expanding stent system made of Ni-Ti alloy. It consists of a self-expanding stent and a delivery system. The delivery system comprises a delivery wire and an introducer. The self-expanding stent is pre-installed at the delivery wire in the introducer. The stent system has tantalum markers on the ends, which are coated by polymer. The delivery wire is made of a radiopaque Ni-Ti wire core. The introducer is composed of cone-shaped polymer and sterilized by ethylene oxide. The stent system can still be recovered at 70% delivery for repositioning. It is 4.5 mm in diameter and has four length specifications (14, 22, 28, and 37 mm). It is suitable for stenotic vessels with diameters ranging from 2.5 to 4.0 mm. Patients in the drug group will be treated with aspirin only. The initial dosage will be 300 mg/d; this will be decreased to 200 mg/d 6 months later and to 100 mg/d 1 year later. NIHSS score 1 year after stent implantation. The patients' neurologic deficits will be evaluated with the NIHSS score 1 year after stent implantation with antiplatelet medication or antiplatelet medication only (Kwah and Diong, 2014). The NIHSS is a 43-point scale, with higher scores indicative of more severe neurologic deficits. It consists of 11 items: (1) level of consciousness, (2) nest gaze, (3) visual fields, (4) facial palsy, (5) left (right) arm motor, (6) left (right) leg motor, (7) limb ataxia, (8) sensory, (9) best language, (10) dysarthria, and (11) extinction and inattention. NIHSS score 0.5, 2, and 3 years after either treatment. Barthel index of the patient's activities of daily living 0.5, 1, 2, and 3 years after either treatment (Sulter et al., 1999). The Barthel index is a 101-point scale, with higher points indicating decreased disability. A score of 0 to 20 points indicates extremely severe disability, 25 to 45 severe disability, 50 to 70 moderate disability, 75 to 95 mild disability, and 100 normal. Carotid stenosis rate 1 year after either treatment. Following digital subtraction angiography (Siemens Medical Solutions, Erlangen, Germany), Seldinger-guided femoral artery cannulation will be performed. Selective angiography will be conducted to harvest bilateral carotid artery images from the anteroposterior, oblique, and lateral views. The following formula will be used: carotid stenosis rate = (diameter of distal stenotic segment-diameter of narrowest segment) / diameter of distal stenotic segment × 100%. Patients' baseline and clinical characteristics are shown in [Table 2] and the schedule for outcome assessments is shown in [Table 3]. Possible adverse events associated with Enterprise stent implantation include puncture site hematoma, vascular spasm, bradycardia, hypotension, cerebral hyperperfusion syndrome, device shifting, local ischemia, vascular occlusion, ischemic stroke, intraoperative hypertension, postoperative hypotension, and hypoglycemia. If adverse events occur, details of the event including the date of occurrence, treatment-related measures taken, causal relationship with the treatment, and treatment itself will be reported to the principal investigator and the institutional review board within 24 hours. All data will be collected in case report forms and collated. Collated data will be input into an electronic database using a double-data entry strategy by trained professional staff. Information accuracy will be checked when all included patients are followed up. The collected data will be locked by a researcher in charge and will not be altered for later review. All data related to this trial will be preserved by Beijing Chao-yang Hospital, Capital Medical University, China. The electronic database will be fully known to a professional statistician for statistical analysis. Anonymized trial data will be published at http://www.figshare.com. All data will be statistically analyzed by a statistician blinded to randomization using SPSS 17.0 software. The successive normally distributed variables will be expressed as the mean ± SD. The non-normally distributed variables will be expressed as median and quartile. Classification variables will be expressed as count and percentage. A two-sample t-test (normally distributed data) or the Mann-Whitney U test (non-normally distributed data) will be used to compare the NIHSS score and Barthel index between the stent implantation and drug groups. The chi-square test or Fisher's exact test will be used to compare the carotid stenosis rate between these two groups. A P level of < 0.05 will be accepted as statistically significant. Trial progression will be reported to the ethics committee of Beijing Chao-yang Hospital, Capital Medical University, China every 1 year, and the trial's status will be updated in the registration database. Trial data include paper and electronic forms. Electronic data will be preserved in a dedicated password-protected computer and managed by a data management professional. Data reported on paper will be preserved in a secure, locked place for future viewing. There is a lack of evidence from randomized controlled trials regarding the long-term effects of Enterprise stent implantation for the treatment of carotid artery stenosis after ischemic stroke. The existing reports on this topic are case series or case reports with caveats such as a non-randomized, non-blinded design and small sample size. Therefore, we designed the herein-described double-blind, randomized, drug control trial to investigate the efficacy of Enterprise stent implantation in the treatment of carotid artery stenosis in patients with ischemic stroke.The Enterprise stent system is a novel closed-loop, self-expanding stent that is made of Ni-Ti alloy and shows favorable flexibility and ease in use. Its use was approved in 2009 in China (Gao and Mahk, 2010). The current clinical evidence regarding use of the Enterprise stent system mainly addresses aneurismal treatment (Mocco et al., 2009; Rohde et al., 2010; Vendrell et al., 2011). In this study, we will use the Enterprise stent system to treat carotid artery stenosis in patients with ischemic stroke, which is of important clinical significance for secondary prevention of ischemic stroke. In addition, because there is no long-term follow-up evidence regarding Enterprise stent implantation for the treatment of carotid artery stenosis after ischemic stroke, a 3-year follow-up will be performed in this study. In this study, a simple antiplatelet drug will be used as the control intervention to investigate the superiority of Enterprise stent implantation in combination with antiplatelet medication over antiplatelet medication alone in the treatment of carotid artery stenosis. Outcomes from this study will add objective, rigorous evidence obtained from a double-blind, randomized, controlled long-term follow-up trial to the current body of knowledge regarding Enterprise stent implantation for the treatment of carotid artery stenosis after ischemic stroke. Recruitment of participants is ongoing at the time of submission. Ai MH, Yang LB, Huang J, Lv XD, Fan YM (2009) Comparison of the curative effect between the stent-assisted angioplasty and medical treatment on internal carotid artery stenosis. Shengwu Biomed Eng Clin Med 13:225-227. Chimowitz MI, Lynn MJ, Derdeyn CP, Turan TN, Fiorella D, Lane BF, Janis LS, Lutsep HL, Barnwell SL, Waters MF, Hoh BL, Hourihane JM, Levy EI, Alexandrov AV, Harrigan MR, Chiu D, Klucznik RP, Clark JM, McDougall CG, Johnson MD, et al. (2011) Stenting versus aggressive medical therapy for intracranial arterial stenosis. N Engl J Med 365:993-1003. Elserwi A, Amer T, Nermin Soliman, Ghada M. Gaballa, Ali H. Elmokadem (2016) Efficacy and safety of carotid artery stenting for stroke prevention. The Egyptian Journal of Radiology and Nuclear Medicine 47:185-192. Gao B, Mahk AM (2010) Possible mechanisms for delayed migration of the closed cell designed enterprise stent when used in the adjunctive treatment of a basilar artery aneurysm. AJNR Am J Neuroradiol 31:E85-86. Halliday A, Mansfield A, Marro J, Peto C, Peto R, Potter J, Thomas D; MRC Asymptomatic Carotid Surgery Trial (ACST) Collaborative Group (2004) Prevention of disabling and fatal strokes by successful carotid endarterectomy in patients without recent neurological symptoms: randomised controlled trial. Lancet 363:1491-1502. Hobson RW 2nd, Weiss DG, Fields WS, Goldstone J, Moore WS, Towne JB, Wright CB (1993) Efficacy of carotid endarterectomy for asymptomatic carotid stenosis. The Veterans Affairs Cooperative Study Group. N Engl J Med 328:221-227. Huang HD, Zhao K, Gu JW, Qu Y, Yang T, Xia X, Lin L, Zhang H (2010) A novel intracranial Enterprise stent together with coils for the treatment of very small intracranial wide-necked aneurysms.Jieru Fangshexue Zazhi 19:91-94. Kelly ME, Furlan AJ, Fiorella D (2008) Recanalization of an acute middle cerebral artery occlusion using a self-expanding, reconstrainable, intracranial microstent as a temporary endovascular bypass. Stroke 39:1770-1773. 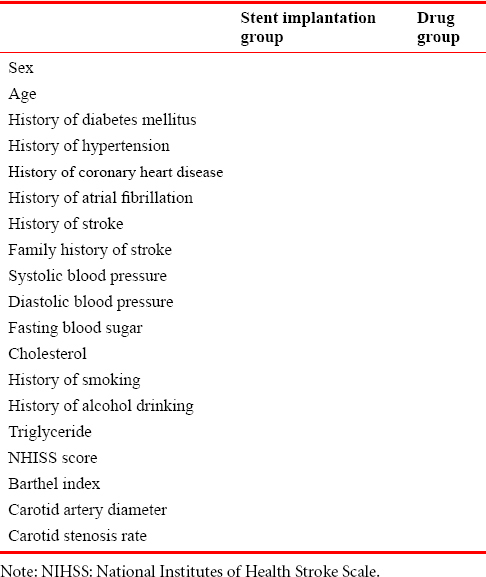 Kwah LK, Diong J (2014) National Institutes of Health Stroke Scale (NIHSS). J Physiother 60:61. Li M, Zhu YN, Liao YH, Luo WL, Liu W, Deng YP, He Y (2013) enterprise stent for symptomatic atherosclorefic stenosis in middle cerebral arteries. Zhongguo Shiyong Yiyao 8:17-19. Mocco J, Snyder KV, Albuquerque FC, Bendok BR, Boulos AS, Carpenter JS, Fiorella DJ, Hoh BL, Howington JU, Jankowitz BT, Liebma KM, Rai AT, Rodriguez-Mercado R, Siddiqui AH, Veznedaroglu E, Hopkins LN, Levy EI (2009) Treatment of intracranial aneurysms with the Enterprise stent:a multicenter registry. J Neurosurg 110:35-39. Rohde S, Bendszus M, Hartmann M, Hähnel S (2010) Treatment of a wide-necked aneurysm of the anterior cerebral artery using two Enterprise stents in "Y"-configuration stenting technique and coil embolization: a technical note. Neuroradiology 52:231-235. Stampfl S, Ringleb PA, Möhlenbruch M, Hametner C, Herweh C, Pham M, Bösel J, Haehnel S, Bendszus M, Rohde S (2014) Emergency cervical internal carotid artery stenting in combination with intracranial thrombectomy in acute stroke. AJNR Am J Neuroradiol 35:741-746. Sulter G, Steen C, De Keyser J (1999) Use of the Barthel index and modified Rankin scale in acute stroke trials. Stroke 30:1538-1541. Vajda Z, Aguilar M, Göhringer T, Horváth-Rizea D, Bäzner H, Henkes H (2012a) Treatment of intracranial atherosclerotic disease with a balloon-expandable paclitaxel eluting stent: procedural safety, efficacy and mid-term patency. Clin Neuroradiol 22:227-233. Vajda Z, Schmid E, Güthe T, Klötzsch C, Lindner A, Niehaus L, Sperber W, Peters J, Arnold G, Bäzner H, Henkes H (2012b) The modified Bose method for the endovascular treatment of intracranial atherosclerotic arterial stenoses using the Enterprise stent. Neurosurgery 70:91-101. Vendrell JF, Costalat V, Brunel H, Riquelme C, Bonafe A (2011) Stent-assisted coiling of complex middle cerebral artery aneurysms: initial and midterm results. AJNR Am J Neuroradiol 32:259-263. Wang X, Wang Z, Wang C, Ji Y, Ding X, Zang Y (2016) Application of the Enterprise stent in atherosclerotic intracranial arterial stenosis: a series of 60 cases. Turk Neurosurg 26:69-76. Wei XE, Tao ZH, Rong LQ, Liu CF (2011) Carotid angioplasty and stenting and medicine in treating patients with symptomatic carotid artery stenosis. Zhonghua Shenjing Yixue Zazhi 10:1034-1037. Zarins CK (1996) Carotid endarterectomy: the gold standard. J Endovasc Surg 3:10-15.